Samsung launched its alliance program to help business to accelerate mobile strategies through next generation solutions using Samsung’s innovative products. This alliance program further enables the mobility solutions to the consumers. The growing population and increasing crime rate in India is driving majority of the people towards adopting better security systems. The rising security concern along with ongoing technological advancements in the smart door lock industry is shifting many people towards electromechanical locks from mechanical locks. Further, up surging urbanization, personal disposable income and real estate industry are some of the factors to supplement the growth of the India smart door lock market with a CAGR of 36.15% over the period 2016-2023. 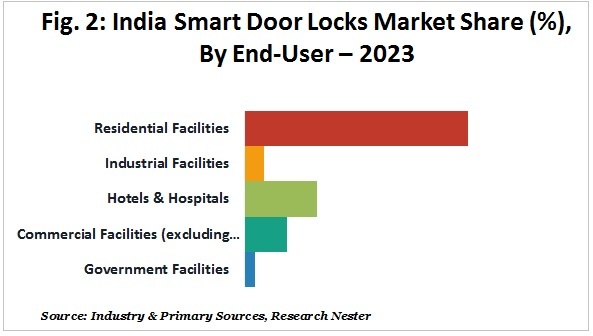 Riding on the back of rapid infrastructural development & expansion in corporate sector, smart door locks market in India is experiencing a remarkable growth and is further predicted to reach USD 652.04 Million by 2023, rising its way up from USD 75.19 Million in 2016. Additionally, a huge demand from private realtors and housing companies in metro cities such as Delhi, Kolkata, Bangalore and others is expected to promote the sales of smart door locks. The adoption of smart security systems and rising demand for home automation systems for better security in houses are expected to accelerate the growth of the India smart door locks market during the forecast period. Moreover, the rising popularity of mobile app based smart door locks is expected to boost the market share of locks being operated through mobile phones. The growing use of smart phones in India and rising use of mobile apps is driving the consumers towards the adoption of mobile app based smart door locks. The India smart door lock market has been segmented by application into mobile application based door locks and non-mobile application based door locks, out of which, the non-mobile app based locks segment has dominated the overall smart door locks market in India and is expected to maintain its dominance in near future. The reason behind this is the consumer behavior towards new technology combined with apprehension related to security concerns in mobile app based smart door locks. However, with rising use of mobile phones, internet and other smart devices, more people are shifting towards mobile app based door locks. In India smart door lock market, the biometric smart door locks are gaining traction among the population living in metro cities such as Delhi, Mumbai, Bangalore, Kolkata and others. The biometric type segment in India smart door lock market is further segmented into face recognition, palm recoginition, iris recognition, voice and fingerprints recognition, out of which, the smart door locks based on Iris technology are among one of the fastest growing trends in the Indian market owing to rising criminal activities in urban cities of India. Further, the quick response combined with ease of availability and installation services for fingerprint recognition are some of the main reasons behind the dominance of the fingerprint recognition segment in the biometric type section. The India smart door lock market is divided by end-users into government facilities, commercial facilities (excluding hotels & hospitals), hotels & hospitals, industrial facilities and residential facilities. Among these facilities, the residential facilities segment held the dominant share during 2016 and is believed to expand with dominant growth over the forecast period. This can be attributed to the robust growth in smart residential facilities in metro cities, adoption of smart security systems and rising popularity of home automation in urban regions. Furthermore, residential sector is estimated to be the biggest cash cow (with market size of around USD 380 Million in 2023) followed by hotels and hospitals segment (with market size of around USD 120 Million in 2023). The robust growth in the hotel industry is witnessed on the back of rising tourism industry which is further expected to increase the number of hotels and installed security systems. In addition to that, the up-gradation of security systems in well-established hotels are projected to allow a burgeoned demand for electric strike and magnetic strip locks along with mobile app based features. The India smart door lock market is segmented by distribution channel into online and offline stores. According to the figure below, the offline distribution channel segment is anticipated to be the most attractive distribution channel for new entrants looking to enter in the market, existing players looking for business expansion and investors seeking investment opportunities over the period 2016-2023. The growing sales of the smart door locks through offline distribution channels such as home décor shops, hardware stores and others is the major factor behind the flourishing market of smart door locks in India. On the other hand, online channel segment would support the sales number for market players and could become one of the major factors for growth if provided with installation services for locks bought though online portals. The India smart door lock market is thriving on the back of increasing crime rate in India which is forcing people to move towards better security facilities and technologically advanced security devices. The growing trend of electronic security systems on the back of rising theft and criminal activities is expected to boost the demand for the smart door locks. Further, the market is heavily impacted by the rising concern towards security of premises in hospitality sector. Rapid increase in the India crime rate will swell the demand of better security facilities across India. Additionally, mounting security concerns due to transaction and identity frauds have led to an increase in the installation and adoption of smart door locks which is also believed to aid the India smart door lock market to grow in near future. 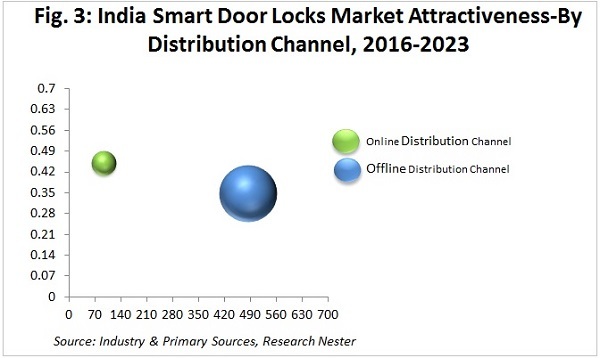 There is a long run for the market of smart or digital locks in India even though majority of the consumers are reluctant towards smart door locks. The security and quality concerns along with low internet connectivity in many areas, reluctance to complexities related to change of batteries related to smart door locks’ working and complexities related to installation are some of the major other factors restricting the demand for the smart door locks in India. Some of the affluent industry leaders in the India smart door lock market are Samsung Smart Homes, Yale, Godrej, Kwikset, Lockitron, Haven, Schlage, Sentrilock and August. 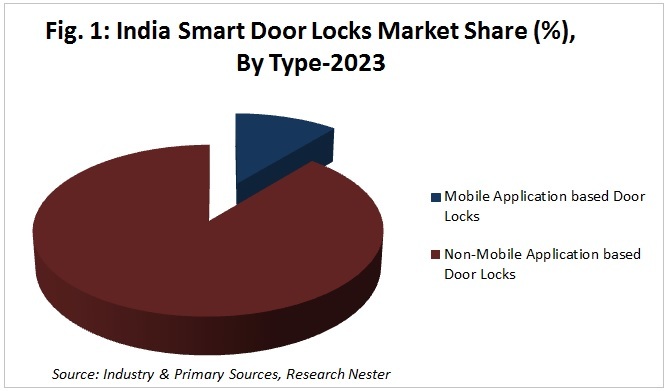 Moreover, other key and niche players are working towards the expansion of product portfolio along with investing in high quality R&D to develop highly secure and innovative smart door locks in order to gain competitive edge in the India smart door lock market.